As a concerned parent (and now a parent of a child with special needs) I feel it my responsibility to get my son’s story out. I will continue to write all venues of the media (especially those specific to children & parents) until this story finally garners the nationwide attention it should have. 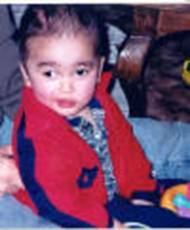 On December 16, 2001, I laid my 14-month old son Michael down for his afternoon nap and continued to prepare for his older brothers, Daniel & Tony's, joint birthday party (Daniel 12/17, Tony 12/15). When I tried to awaken Michael from his nap, he was unresponsive. Feeling scared, I contacted the hospital and paramedics. Norco paramedics arrived almost immediately and transported my son to Kaiser Hospital, Riverside. Once there several ER staff started to work on my son. At one point a Dr. asked my husband and myself to leave the room while they intubated my son, we refused to leave him alone (this was used against us as we were accused of exhibiting "suspicious behavior"). After a spinal tap was performed, and several vials of blood drawn, Michael was taken in for a CAT scan. The scan revealed a very large subdural hematoma (bleed) on the right side of his brain. The Dr. then informed us that we were to be reported to the police and Child Protective Services, because of the (alleged) nature of the injury to my son. At the time we didn’t think about it, I know Dr.'s must report all infant head injuries to the police for suspected child abuse. We didn’t know then, the nightmare they would put us through. After vehemently insisting (this after the Dr. said he could reduce the swelling with medication) that our son be transferred to Loma Linda University Medical Center, a medical transport team picked him up and rushed him to the pediatric ICU. At LLUMC a neurological surgical team had been assembled and after prepping Michael for 20 minutes, he was rushed into emergency surgery to relieve the pressure on his brain and save his life. The moment we arrived at LLUMC we were treated as if we were monsters having caused such a devastating injury to our son. The police and CPS arrived shortly thereafter and proceeded to interrogate both my husband and myself and then insisted on going to our home a photographing it (they wouldn’t let us stay in the hospital with our son that first night). That same night (unbeknownst to us) CPS (Child Protective Services) made the decision to remove our 2 other children from our home. Now, not only were we scared to death that son may die, we were also scared that we would lose custody of our children permanently. On Dec. 20, 2001 we went to a preliminary hearing and fought to get custody of our children back, we did. Michael however remained in protective custody. On Dec. 21, the doctors told us the diagnoses that would change all of our lives -- Michael had a rare metabolic disorder called Glutaric Aciduria (acidemia) -1 (it mimics shaken baby syndrome), his body does not produce enough of or is completely deficient of a necessary enzyme that helps break down 2 proteins - Lysine & Tryptophan - he would have to be on a special low-protein diet for the rest of his life. Michael was hospitalized from 12-16-2001 to 2-1-2002. When he was allowed to come home, he was functioning at a 0-3 month level. This disorder caused him to have a stroke, cerebral palsy and mild epileptic seizures (petite mal seizures), as a result of this he lost everything he had achieved up until his hospitalization. The dr.'s held out little hope that Michael would regain any or all of his motor skills, speech, etc. They also felt he could not take anything by mouth and suggested that a g-tube (a tube that goes directly to the belly) be surgically placed for feeding. We refused until it was proven without a doubt that he could not eat. I am happy to say Michael takes everything by mouth. Michael’s condition is also very precarious. A simple cold can send him into a severe metabolic crisis and kill him. Fevers can be devastating: On September 30, Michael was hospitalized with a 103-degree fever. He was very lethargic and just didn't seem to have the energy to eat. Luckily we were able to get him to the hospital in time to avoid a crisis, but the financial loss is hitting us hard. I spent every night of the 5 days he was in the hospital with him not sleeping in my own bed until he came home. I am happy to say he is back to his usual happy self and continuing therapy with no underlying problems. When we found out what Michael had, my husband & I went online to find out everything we could about Michael's disorder (we were allowed to do this at work since we do not have a computer at home). The information we found was disheartening. Most of the children who have this disorder do not progress as well as Michael has, and most have died before their pre-teen years. We also discovered that the test for his disorder was available when Michael was born, California just didn’t offer it. Had this been offered to us upon Michael's birth, we might have been able to avoid the nightmare I described above. As of Jan 7, 2002, California hospitals are NOW supposed to offer this new expanded screening to all parents of newborns; I have found out though, that this is not the case. My sister-in-law recently gave birth to a little girl in June 2002. Because of what happened to Michael, she asked for this test. After getting the run around the hospital finally agreed to do it. As of 9/17 this test still has not been performed. Our family’s life now revolves around Michael and his care. Even Daniel (9) and Jessica (7) get very involved, helping to feed him or entertain him. They even look at labels to see how much protein a certain food contains. Whether we go out or not depends on how what kind of day Michael is having. My husband & I have not been out, alone, together since Michael's hospitalization. Michael now goes to therapy 3 times a week and his progress has been miraculous. The Dr's have now adopted a "wait & see" attitude and have quit telling us what he cannot or will not be able to do. Michael can, with the help of a gait trainer, walk! We are hoping that soon he will not need this. Michael still has a long way to go, but we feel that while he may not regain everything he lost, we feel confident he will get most of it back. I began a letter writing campaign on Dec. 24, 2001 and continue to do so to this day. I want to bring awareness to the public and Government about this and other rare disorders and strongly encourage ALL parents of newborns to get their children screened. The cost of having a child like Michael is enormous and if you are like we are (middle income), you make too much money to qualify for programs that can assist you and too little to pay for what you need. My childcare costs have doubled, we live paycheck-to-paycheck and struggle every week to pay our mounting bills, and we frequently have to put someone off so we are always behind. Since my son’s condition is so rare there are no “celebrity” advocates. No nationwide fundraisers. I have been trying since December 21, 2001 to get any celebrity or known philanthropist to become interested. I thank God everyday, that my son is still alive, and marvel constantly at his progress. My son is a fighter and he has proven that everyday since being hospitalized. I only wish other children like him had his strengths.